Quality baby clothes are important because they help keep your baby comfortable and safe. Unfortunately, it’s not as simple as you would think to pick out the good baby clothes from the bad ones. That’s why we put together this complete guide helping you locate the best baby clothes made in the USA today. Below are our recommendations, tons of details about each one, and the factors we considered in our research. After searching through offerings from dozens of USA-based baby clothing manufacturers, we were able to narrow our list down to 9 top recommendations for different categories. To highlight a few, we were thoroughly impressed by the looks and strength of the Kumquat line of baby dresses, and the CastleWare footie pajamas offered just the right balance of features to be a top sleepwear option for babies. Those two brands and much more are below. Below are tons of additional details about each of our top recommendations, along with what we liked and didn’t like about each one and where to get them. When searching for the best footie pajamas for your little one, it’s hard to pass over the pajamas created by CastleWare. Made in Los Angeles, CA, these pajamas are designed for maximum comfort and utility. 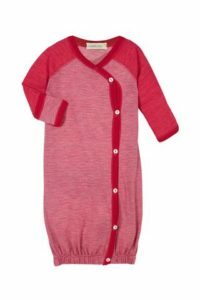 We were impressed with the soft feel of the pajamas as well as the use of elastic around the ankles to keep your baby’s feet in the right position. These pajamas feature grippy dots on the bottom of the feet, offering excellent traction when your little one is crawling around the house. These footie pajamas are made from a mix of cotton and fleece that’s 100% organic and they’re machine washable for easy maintenance. “I manufacture in the USA because I feel strongly about supporting people who ‘make’ things,” says Maureen Smithey (founder of Castleware), who we had the pleasure of speaking with. “It has not been easy and it has not been a get-rich-quick plan but it has been fulfilling to be a part of the growing ‘made in the USA’ and ‘shop local’ movement.” We love their dedication, and it shows in the quality of their baby clothes. Baby sacks are a popular way to keep little ones warm at night before blankets are safe for use, and PAIGELAUREN offers one of the top options available to parents today. We believe that these sleep sacks are designed for optimal comfort and longevity. The sacks all feature heavy stitching at all the wear points for long-term wear. They are equipped with tough seashell buttons that offer a good firm closure. They are also made from a supremely soft mixture of Supima cotton, polyester, and micro-modal that’s comfortable and very warm at the same time. These sleep sacks are impressively designed and a good option for parents looking to keep their infants warm and comfortable at night. The Boho Onesies sold by Soul Flower are a product that parents can feel good about. 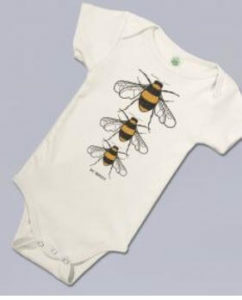 These onesies are free from chemicals and are made from 100% certified organic cotton. “Our customers love our free spirit designs, inspired by nature and music and always made with eco-friendly materials,” says Peggy Rossi, Co-Founder at Soul Flower, who we spoke to over email. The onesies are nice and soft, and highly breathable for comfort in warm and cool environments. 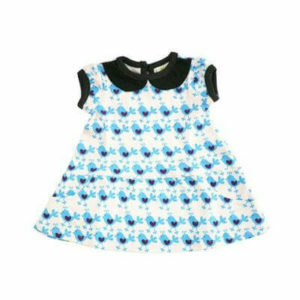 We can’t help but love the variety of beautiful toddler dresses available from Kumquat, made in California. 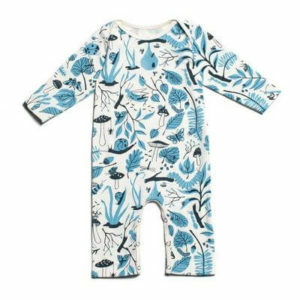 These are some of the best baby clothes made in the USA today because they’re manufactured for strength, but also have beautiful designs. These 100% cotton dresses have tons of color and pattern options. They are available in a range of sizes, feature heavy stitching with a tough knit design, and are the perfect thing to make your little one stand out. Lucy & Leo is an American company that specializes in dressing up little ones in more traditional looking outfits. We love the classy design of most of the different dresses sold by this company. Each of the dresses are made from 100% organic cotton and they are machine washable for easy maintenance. We love that the different garments are manufactured in New York and that they are heavily stitched with elastic in just the right locations for a snug fit and long-term performance. Parents searching for fun and functional swimwear for their little ones will be impressed by the offerings from American Adorn. This company is well known for making durable swimwear in the United States. The swim trunks and bathing suits are made from a mix of tough materials like nylon and spandex or polyester. They come in a range of colors, prints, styles, and designs to suit everyone’s tastes. Colette Kids has a reputation for creating some of the most attractive baby t-shirts and onesies on the market today, and we were impressed by the different styles offered. The company does a nice job at creating simple t-shirts and bodysuits that are attractive and that have basic graphics that stand out. Each of the shirts is made from 100% organic cotton and the material is sourced and treated for optimal softness. Each shirt is decorated with a screen-printed design to help minimize any dyes used, and they are all machine washable for easy maintenance. Kira Kids garments are an impressive online baby vendor, thanks to their commitment to quality American made garments that come in a huge range of looks, styles, and types. Parents searching for a single store to purchase all their baby clothes from will love Kira Kids. The clothing sold by Kira Kids is made from organic cotton, and sometimes blended with fleece for added warmth. Each of their items is machine washable and dyed with non-toxic ink. They pre-shrink their clothing for a good fit, and they build each piece carefully for maximum strength. This clothing is very nice looking, but it can be costly, which is something that new parents need to keep in mind when shopping at Kira Kids. 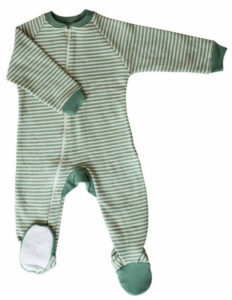 Still, they are a source for some of the best baby clothes made in the USA today – manufactured in San Francisco, CA. We also looked super closely at the origin of materials going into the clothes. Maureen Smithey of Castleware Baby puts it well: “[Parents] feel more comfortable dressing their kids in garments where they can easily trace the origin of the materials used.” We couldn’t agree more. Dressing your little one can be time-consuming, which is why we looked for clothes that are easy to put on and take off. We looked at quick-snap closures, zippers, and other clever designs that make these baby clothes easier to work with. We also looked at washing requirements and favor options that are machine-washable. Good baby clothes need to be tough enough to hold up through hard use and lots of wash cycles. We looked at things like stitching and material quality when choosing from different options. Let’s face it – when picking clothing, style is one of the most important considerations. We looked at things like fit, finish, color options, and overall design when choosing specific baby clothes providers.